The Desert Sky Hotel was located just down the street from the Bagdad Inn at 3541 E. Van Buren Avenue. Van Buren Avenue, also known as Route 60, was the main thoroughfare between Phoenix and Los Angeles before the interstate system was built. Designed with an accent on vacation luxury in the Valley of the Sun. Featuring a beautiful coffee shop – Heated Swimming Pool – Television – 24 hour phone service – Cooled by Refrigeration – Beautifully landscaped patio. 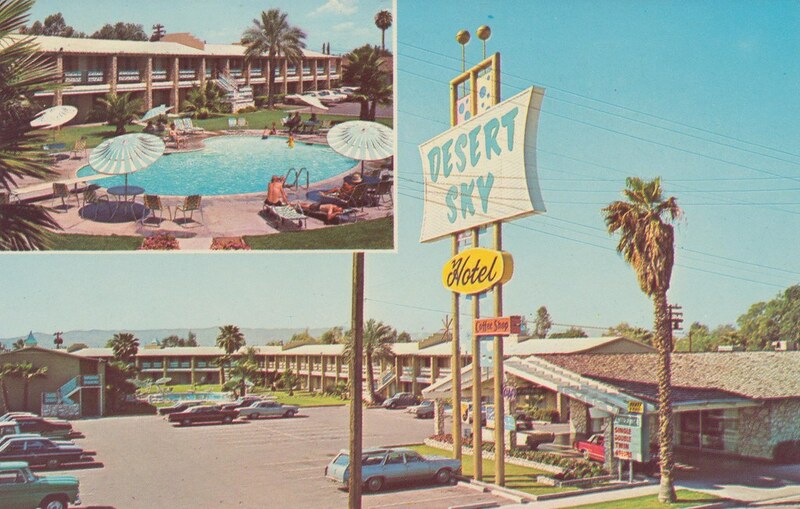 The Desert Sky Hotel and coffee shop opened at the beginning of 1961 on the site of the old ABC Motor Court. The coffee shop featured good coffee and $.80 economy luncheons.The Sea food plates would start at $1.35 and all-you-can-eat chicken dinners were priced at $1.40. I cannot find much about the hotel itself. I have a feeling that it suffered the same fate as many of the other motels along E. Van Buren as the road and the motels became a relic of a different era. The building is still standing and is a Budget Inn.